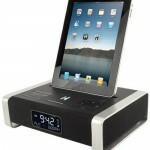 The iDM71 iPad/iPad 2 Case has a stereo speaker system built into it thanks to flat NXT stereo speakers. The case is made of a faux leather material, and will fold into six positions, so no matter what typing angle you prefer, it’s all good. It can also be used as a movie stand. 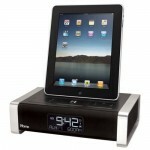 The iHome iDM71 iPad/iPad 2 Case with Built-in Rechargeable Stereo Speakers will cost $99.99. 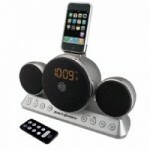 iHome is also offering a cool new iPhone dock, the iA17 App-enhanced Color Changing Stereo FM Alarm Clock Radio for iPhone/ iPod. This alarm clock features a “wake-to-color” mode. The translucent cabinet will change color, with five colors available. The alarm clock also has an FM radio, and it is an app enhanced device that works with the iHome+Sleep app, and the iHome+Radio app. The iA17 alarm cloak radio is $99.